It was early August when I first spotted my target buck. 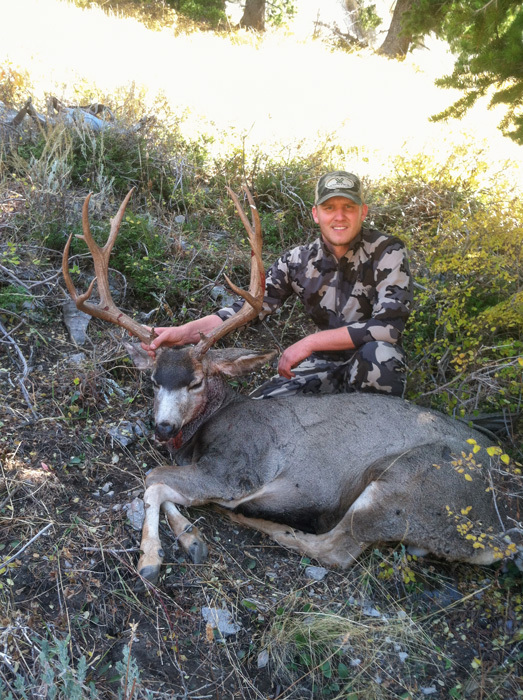 I was glassing with my hunting partner, Chet, when we came across a buck at over 1,600 yards. He didn’t look like much by himself, but we soon realized just how big he was when he stepped next to a good four point and dwarfed him! We tried to hunt him during archery season, but we weren’t successful. 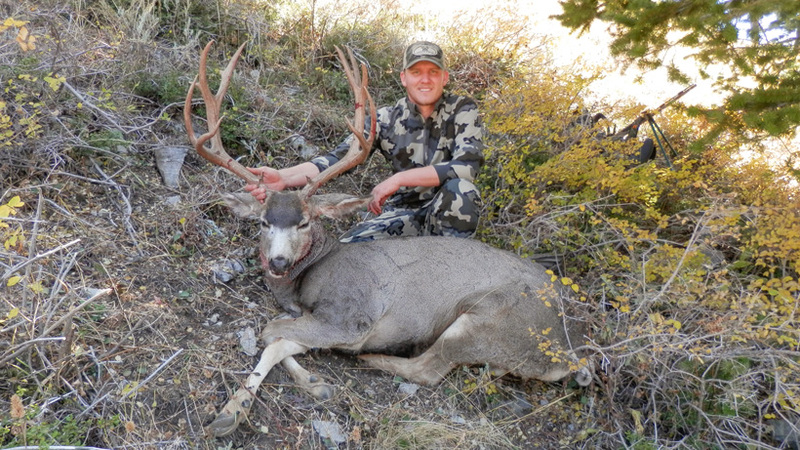 Because we are both Dedicated Hunters in Utah, we were allowed to hunt archery, muzzleloader and rifle seasons in a chosen unit. 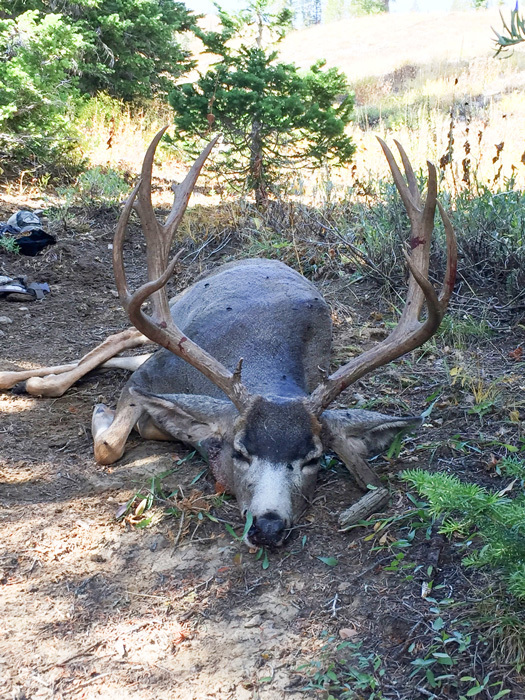 Once archery season ended, we geared up to stay another five days to hunt this buck. 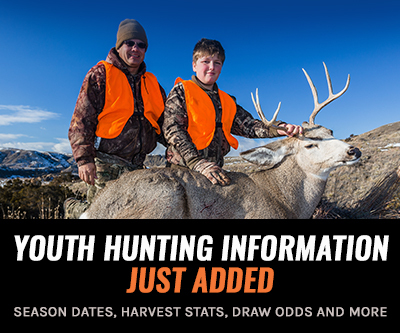 Another buddy, Brody, had also spotted the same buck so we decided to hunt together and use teamwork in order to be successful. Because there were three of us after the same deer, we decided beforehand to be fair; whoever spotted him first each time got to make the stalk and have the first chance at a shot. Brody and his dad, Brad, rode horses in Tuesday afternoon. Chet and I couldn’t hike in until after 3 p.m. After a three-hour hike, we arrived at Brody’s camp and found him already filming the buck. We made a game plan for the morning and settled into camp for the night. Wednesday morning finally rolled around after a bad night’s sleep. By 5 a.m., we were already hiking. We met at the designated spot and waited for light with anticipation. We soon realized that our predetermined glassing spot didn’t have the view that we’d hoped for. At first light, I moved down the ridge to get a better vantage point. I hadn’t sat down for five minutes before I saw a doe feeding and another deer appear. The other deer finally fed from behind a pine. It was him! I checked the range at 330 yards. He was too far away. I watched him feed into a finger of pines and ended up losing him. Bummed, I headed back to Chet and Brody to tell them that I had saw him. Brody didn’t believe me, but Chet, knowing me a little better, knew otherwise. We glassed most of the morning before I spotted him again at 11:30 a.m. bedded below a cliff. Game on! Chet and I took off to get on top of him to see if we could get a shot. After an hour stalk, I was on my belly with my gun hanging off the cliff trying to see the bedded buck. Without a visual, we were forced to back out and wait for another opportunity. That night we didn’t see him again though we did hear a bull bugle all night and watched Brad stalk after a small 4 point. He was busted by some does, which ended that stalk quickly. After Brad got back, we agreed to go check out a different area that was close by. Brad saw a buck in this area that he was interested in. 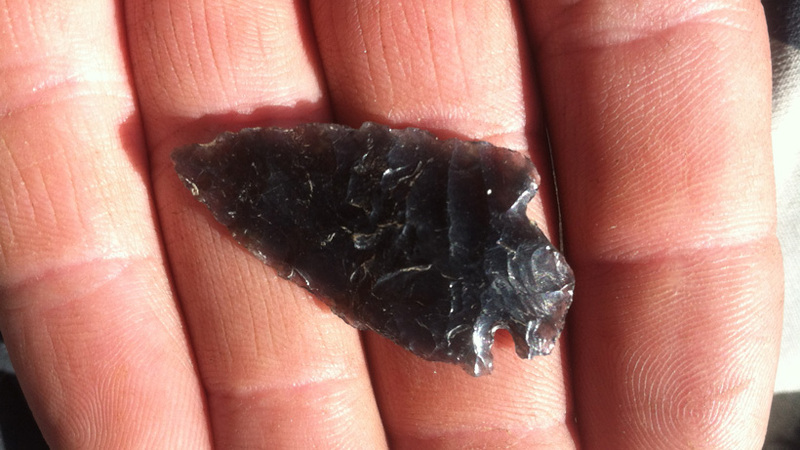 As we hiked along, I happened across an obsidian arrow head in almost perfect condition! Good omen? I’d like think so. We weren’t the only ones who once stomped these hunting grounds! The night’s glassing was pretty uneventful; we only spotted a few small bucks so we headed back to camp in the dark. Thursday morning rolled around. Since we didn’t see the buck Wednesday night, we decided to glass from our normal ridge. As luck would have it, I spotted the buck again. I explained where the buck was. This time, he was a lot closer and in a much better spot for a stalk, having moved from the usual wash that he’s lived in over the last six weeks. He had a small 2 point with him. After bringing Brody up-to-date, he and his dad decided to go around and sit a couple hundred yards to the west side of him in case I missed and the buck went on an escape route. That way, they could get a shot. I stalked to 500 yards and came to a group of pines, ready to make my move. Then, to my surprise, I blew a deer out of its bed. I thought I was had. I sat tight for a minute and just watched the two bucks feed. 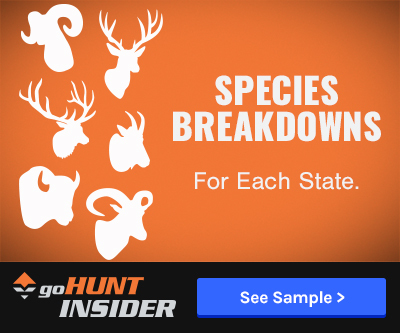 At this point, Chet got on the radio and said that the bigger buck bedded down in some jack pines and the 2 point continued to feed to the west. I continued stalking, getting closer by each carefully placed step. My heart rate started climbing as I realized how close I was getting. I came to a clearing between two pines that I could see through; I ranged his bed at 192 yards. I was OK with that shot, but was thinking of a way to get closer. I set up for a minute and watched his bed. The 2 point must have seen me move or smelled me because he started grunting and blowing, which caused the big buck to stand. I was ready lying behind my gun, waiting and waiting. The 2 point ended up losing interest and fed out of the basin, leaving just me and the big buck. After about five minutes he bedded back down. This was going to be a long wait. I looked at the time. It was 9:15 a.m. The more I waited the more I got thinking about the shot distance. I wasn’t 100% comfortable with a 200 yard shot so I decided to move closer to the next finger ridge in front of me. I crawled to the point and set up for the shot. I ranged a few places and was at 125 yards on the dot. Perfect! The only problem was that my new location was completely open without any shade. It was nothing but sun, which wasn’t bad for the first hour, but the second hour was horrible. By 2 hours 45 minutes, I was cooking alive. I started getting antsy and impatient. I got on the radio and asked Chet if I should get aggressive and try to move in on him and bump him out. The minute I said that, though, I knew the answer and I knew what I should do. I looked through my one power scope and waited on the spot that he would walk through. This was it! I was ready! I’ll never forget how yellow his beautiful rack looked in the late morning sun when he stepped out. I found the shoulder and waited for him to take one last step. Then, I squeezed the trigger, the gun lurched and I instantly heard the smack as the giant fell. Then the shakes came! I was pumped! We did it! We killed this giant buck and I was the lucky one who got to tag him. I couldn’t have been happier. 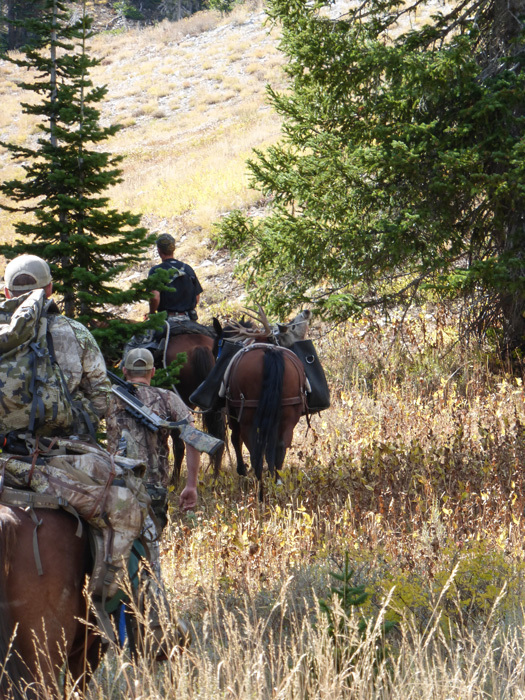 I’d like to thank Brody and Brad for their help and generosity during the five days we hunted together and for using their horses to help pack things out. Also a big thanks to Chet for being a hunting partner and friend that is so willing to go the extra mile and to put forth the effort that he does to help me out. Thanks, buddy! 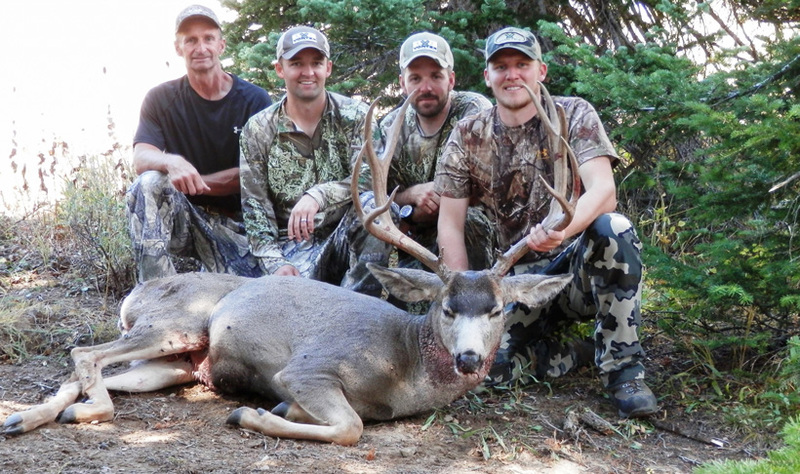 All said and done, it came down to teamwork and patience to shoot a deer like this.